You see, I have a rather unhealthy obsession with Bubble Tea. If you’re a regular around these parts, then you know a visit to The Bubble Tea Co. at V&A Waterfront is part of our daily routine when we go on holiday in Cape Town. My current favourite Bubble Tea flavour is ‘milky watermelon with rooibos tea, lychee bobas and extra original nata de coco’. So yum. Pearl (sounds like a character from ‘The Golden Girls’, doesn’t it?) gives off a wonderfully uplifting and sweet rose scent, and contains pink sago bubbles (similar to tapioca pearls) that give it a textured look and feel (much like the LUSH Wiccy Magic Muscles, you can read my review here). A textured massage bar will help work out muscle tension & boost circulation to leave you feeling relaxed. 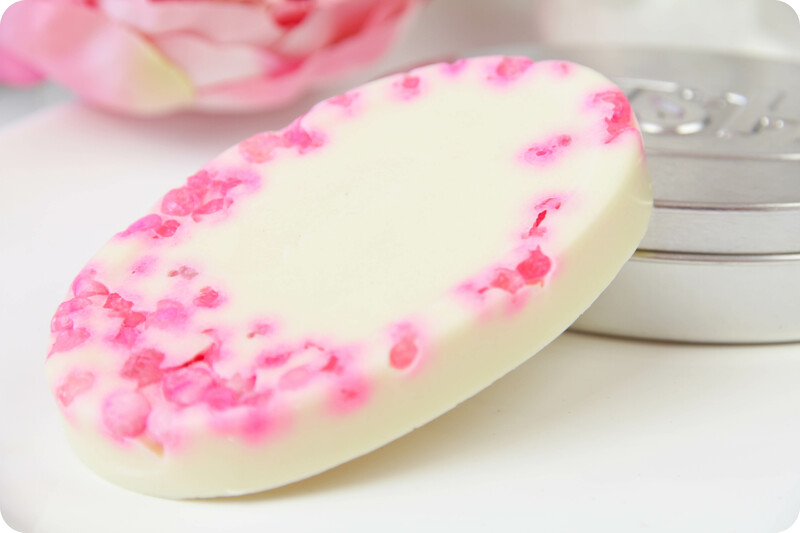 This sweet & floral scented bar contains a blend of antioxidant argan- and calming rose oils and melts quite easily onto your skin to delicately scent it. I find the scent also rather uplifting, almost like a pick-me-up on those dreary days. I like to glide the massage bar directly over dry skin (once I’ve hopped out of the shower), it starts to melt upon contact with the skin but it’s not messy at all (no oil flying everywhere). I massage & rub the oils into the skin, focusing on tired or tense muscles – for me, my problem areas are my shoulders (trapezius muscle) and upper neck muscles. Since the LUSH massage bars are made with natural butters & oils, it’s best to wait for a couple of minutes before putting on your PJs (just to make sure everything is absorbed). With Pearl, I found I didn’t have to wait very long for the oils to be absorbed. I’m a bit impatient anyway (instant gratification and all that), and didn’t notice any stains on my PJs or bed sheets. Pearl also contains fair trade organic cocoa butter, shea butter & coconut oil, which means it’s super moisturising, perfect for the chilly Winter days ahead. I love that LUSH decided to add a sprinkle of lemon oil, which gives the fragrance a slightly fruity & zesty citrus burst. I think the inclusion of the lemon oil, takes the scent to the next level – it’s not just your boring ol’ rose-scented bath / body product. Trust me, nothing about this massage bar reminds me of a granny…except for the name. If you love the beautiful rose scent as much as I do, then hop in the bath with the LUSH Rose Jam Bubbleroon before using Pearl to massage your skin. This will ensure a longer lasting fragrance on the skin. Pearl has left my body feeling gorgeously soft and nourished whilst adding some much needed hydration back into my skin. I find the light sweet rose scent of Pearl to be extremely comforting & soothing, and it lasts on the skin for most of the day. I also love that the oils give the skin a beautiful natural-looking glow. From what I’ve heard, Rose Jam is one of their most popular scents EVER – mainly because it’s very appealing to those that like the non-typical floral scents. Because of this, Pearl is one of LUSH’s best sellers in the UK and I can totally see why! Top Tip: Massage bars melt at body temperature, so be sure to keep yours somewhere cool, dry and out of direct sunlight. LUSH also sell a silver storage tin for their massage bars, they retail for R 20,00. 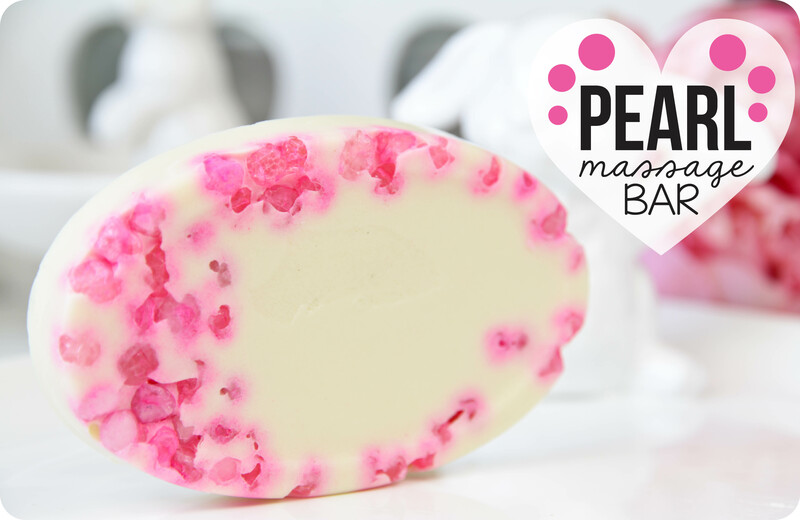 Pearl Massage Bar is vegan friendly and retails for R 95,00 in the LUSH South Africa online store or at your nearest LUSH store (Cavendish, V&A Waterfront, Canal Walk, Gateway and now Dainfern Square). 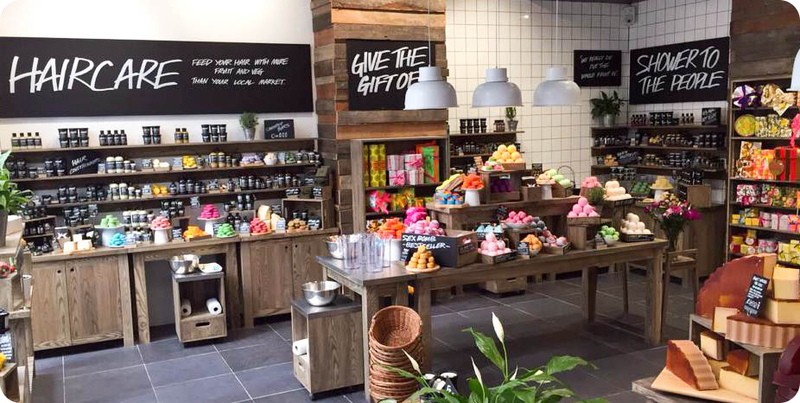 Yep, LUSH has officially opened their 5th store, and it’s in Johannesburg. Hurraaaaah! Head over to Dainfern Square (c/o William Nicol Drive & Broadacres Avenue) to stock up on some LUSH goodies. May I suggest the following products for your first LUSH shop (perhaps not all of them, though, I don’t want to bankrupt you! ): BIG Shampoo, Bubblegum Lip Scrub, Butterball Ballistic, Brightside Bubble Bar, Whoosh Shower Jelly, Buffy In-Shower Massage Bar & Exfoliator, I Love Juicy Shampoo, Mask Of Magnaminty, Ocean Salt Face & Body Scrub, Oatifix Fresh Face Mask, Lemony Flutter Cuticle Butter or Wiccy Magic Muscles Massage Bar. I’ve written reviews on most of the afore mentioned products, so just click on the name & it will take you through to my review blog post. If visiting the Dainfern Square store will be your first ever LUSH experience, remember to do the following: Step into the store, take a deep breath, and continue to do your shopping while floating on a cloud of LUSH-scented air. The bar sounds heavenly….but I’m super lazy with moisturizing after my shower! Perhaps if I got one of these it would motivate me to actually put something on my skin before it turns to leather. Your pics are gorgeous as always!! LOL! I’m so happy you’re loving Bubble Tea as much as I do! I know it’s not for everyone, but I don’t think I will ever grow tired of sipping on a refreshing bubble tea drink & then chewing on popping bobas. Yum! I am the worst at moisturising my skin after I get out of the shower, but Pearl totally helps because it smells so darn good! Sounds amazing, and it’s pink! I see Lush in London has the comforter shower gel! Love that scent the most and hope it comes to SA. The bubble bar is my fav thing from Lush. I’ve never tried bubble tea, but it’s here in Durban too so I think I must pop in and give it a try! *BIG EYES* You have Bubble Tea and you’ve never tried it???? Oh my soul!! You need to get yourself to a Bubble Tea stat! Ek is mal oor Lush! Was verlede week daar (alweer) en het die keer vir my die sexbomb, avobath,twilight,honeybee en brightsidr bubblebar gekry! Mens dink altyd : ai dis bietjie “pricey” maar as ju eers in daai bad wegsink is dit elke rand werd! En bubble tea …. Oooh ek is verslaaf, my heelgunsteling is die coconutmilk/jasminetea met strawberry boabas of pynappel met jasmine tee en appel boabas. Gelukkig bly ek meeste van die takke! En goed om te weet dat dit tot en met 4 dae in yskas kan hou as jy meer wil koop. Happy days! Dankie vir die cool post! Altyd lekker om te lees oor nuwe goedjies! Haha! Dankie dat jy tyd geneem het om so ‘n oulike comment te los, Karin. Oooooh, jou haul klink hemels!!! Ek het nou die dag vir my ‘n Avobath gekoop (het dit nog nooit probeer nie) en gaan dit hierdie naweek bietjie gebruik. Ek hoop hy ruik lekker in die bad… Brightside is een van my ultimates van LUSH, dit ruik so lekker lemoenerig. Ek stem 100% saam met jou, as mens so ‘n hele paar van daai Bubble Bars koop dan tel alles op na ‘n stewige bedrag geld, maar dis so worth it! Oeg, daai Bubble Tea van jou klink lekker – ek sal hom verseker volgende keer probeer as ons weer af gaan Kaap toe vir ‘n vakansie (hopelik is dit weer gou!). I agree, I think LUSH should definitely consider making Rose Jam part of the permanent range (not just the Rose Jam Bubbleroon). YAAAAAASSSSS! I’m going to the Dainfern store ASAP! Thank you for letting us know the store is open, Luzanne. I hope there’s something left for you by the time I’m finished hehehee! Aaaah how I wish I had had this list of “must-try’s” when I first visited Lush… I knew I was going and started making a list – that involved going back through yours and a number of other blogs looking for reviews and recommendations. I think you’ve hit the nail on the head with these ones! So excited to go check out the new Dainfern Square store (although my wallet maybe not quite as much). Partykeer is die winkel so oorweldigend met al die nuwe goed dat ek opeindig om weer net n Twilight te gryp! Sjoe, ek kan nou nie onthou of ek al ooit Twilight gebruik het nie… Sal bietjie gaan sniff aan een by Dainfern Square, maar ek dink amper nie ek het Twilight al gehad nie. I love how this one looks, so bright and cheerful! Going to try your bubble tea variation. I tried my own concoction once and failed dismally. Love your posts as I can always smell and almost taste the products. I went to smell the bubblegum lip scrub and couldn’t leave the store without buying! Will defs try this bar as I thought it was to use in the shower… not afterwards. Aaaah, that Bubblegum lip scrub is just divine…my mouth is actually watering as I’m typing this reply! OMG i need bubble tea in my life and in Joburg! Bubble Tea people if you reading this please hook a sister up. Just ordered lush and didnt order this one but hey i can now go to a Lush store yay and i dont have to travel 50000 miles for a store Im not big on the over powering scent that hits you when you walk into a Lush store but I can make an exception because its Lush. By the way the irish cream Beanies coffee is amazing. I didnt find all of them though. If i dont win the competition I will continue my search. We need Bubble Tea Co. counters ALL OVER SA! No idea why they don’t open more stores in Gauteng, I think they’ll do really well here. What a great post! You always give such a great description that one can actually smell and feel it! Could also do with it for my tense shoulder blades!